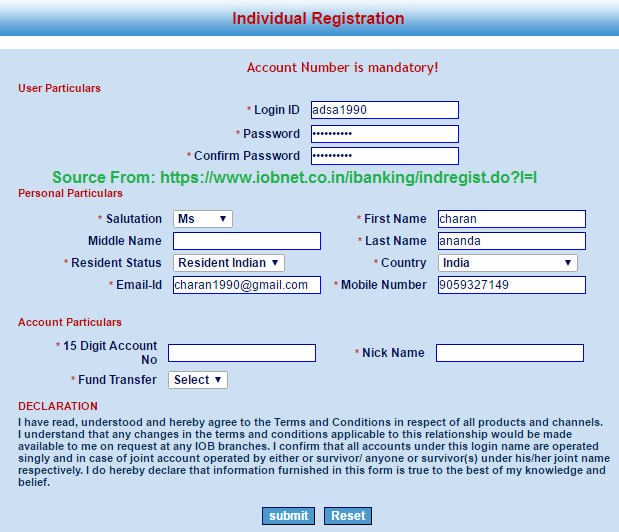 Indian Overseas Bank IOB Online Inter Net Banking Registration for New Retail Individual user apply online at iobnet.co.in…. IOB Mobile Banking: Indian Overseas Bank account holders here we will information another good news for you. Customers who are using Android / Windows / iOS smartphone users those account holders must install “IOBMobile” banking application. It is compatible to all Operating Systems. And then everyone must register in IOB mobile banking. It is very easy process. You can go through your nearest IOB branch. Here we will the step by step instructions on how to activate IOB Online net banking for Indian Overseas Bank for Individual Customers, guidelines are as follows…..
Everyone must keep note the details on paper i.e Email ID, Account Number, Pan Number etc. IOB Individual Net Banking Registration will be open. You can see User Particulars, Personal Particulars and Account Particulars. Under User Particulars You must choose your Unique Login ID and Password. Coming to Personal Particulars you can select the Salutation, Resident Status and Select the Country. Last but not least coming to Account Particulars you can type your Valid and Unique 15 Digit Bank Account Number, Nick Name. You can Select the Funds Transfer Type. Then Click on Submit. You can get an OTP (One Time Password). Enter that.